In 2015 I held a copy of Art De La Guerre (ADLG) in my hands when I visited Britcon. 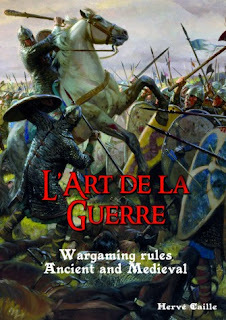 I wanted to get back into medieval wargaming and these rules were one of the options under consideration. At the time I wasn’t certain I was ready to buy a copy it so I put it back while I had a ponder. I wandered off to chat to Tim Porter (@madaxeman). On my way back into the hall I decided I should buy a copy only to find the trader had sold out! One year later I finally got my hands on a copy at Britcon 2016. All this at a time when the first print run of the English edition had sold out. A case of bad luck followed by good luck. Since Britcon I’ve read the rules through once and tried the ADLG online army builder. I have to say I am impressed. After posting on the UK ADLG Yahoo! group I’ve found a local opponent who’s kindly agreed to give complete novice a few training games in ten days time. As a result, I’ve begun the process of reading the rules in detail. So far I’ve looked at how to start a game and how to put together an army list that includes an ally command. Everything looks straightforward and well organised. A re-roll is the obvious solution but I wanted to know if the adjustment was applied every time or just to the first pair of dice. Either would do. "Re-roll adding the difference in initiative each time until there is a difference." That’s my first ADLG query sorted in double quick time. Even so, especially given that this is not the only answer possible, I was surprised to find out that it wasn’t a FAQ. Perhaps I’ll have to start a new series: “ADLG For The Addlepated” anyone? It is a fine set of rules Martin and I hope you enjoy your first foray into it. Having played DBX games extensively in (what now feels like the distant) past, I found Caille's approach far clearer and continue to feel that units perform as you would expect them to on the battlefield. For what it's worth we find 200 point games are the most enjoyable, and, as per p.76, have now had a few very enjoyable games using average dice (2,3,3,4,4,5) to resolve melees. I agree that ADLG is clearer and it survived translation too.